I have had the pleasure of diving in the warm waters of Fiji with the world’s most beautiful soft corals, and the famed Great Barrier Reef with it’s colorful variety of fishes. I have been diving in several places in the Caribbean ocean and spend my “home” days diving in the coastal waters of California, but nothing can compare to the wondrous experience of diving in Hawaii with the Hãhalua aka Manta Rays. 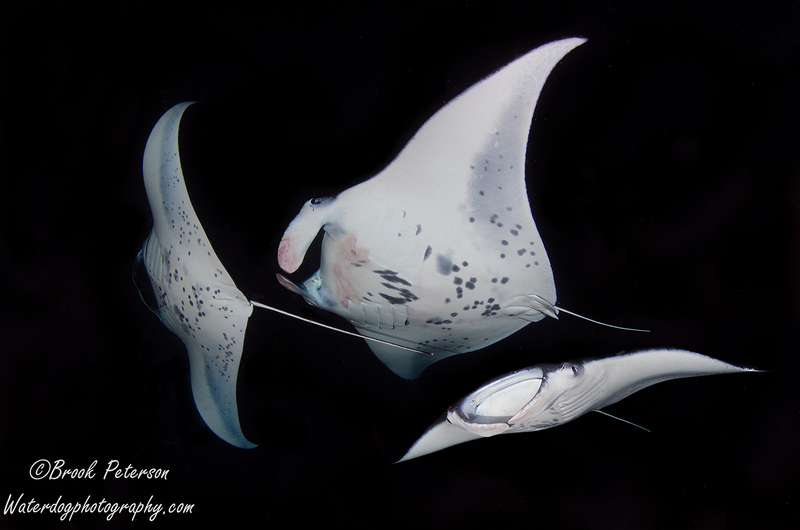 Dive lights illuminate two Mantas as they glide through the water. The dive takes place off the coast of Kailua-Kona, Hawaii. 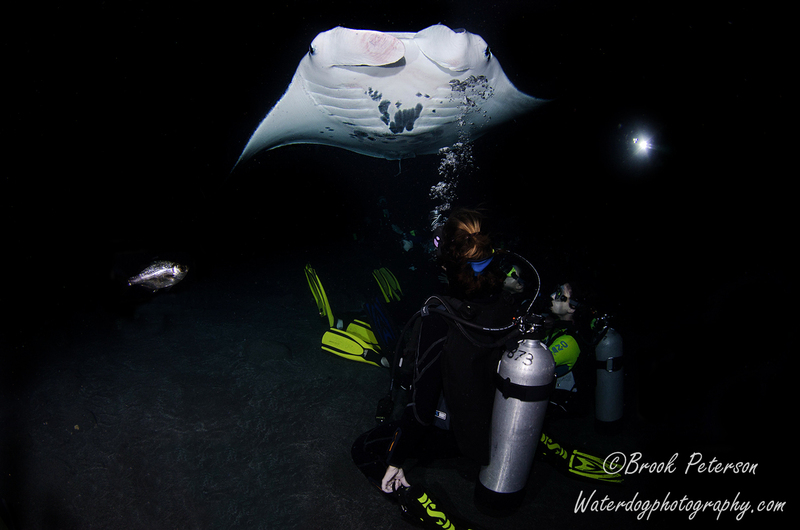 Each night these beautiful coastal Manta Rays come in to feed on the plankton that is attracted by the diver’s and boat operator’s lights. 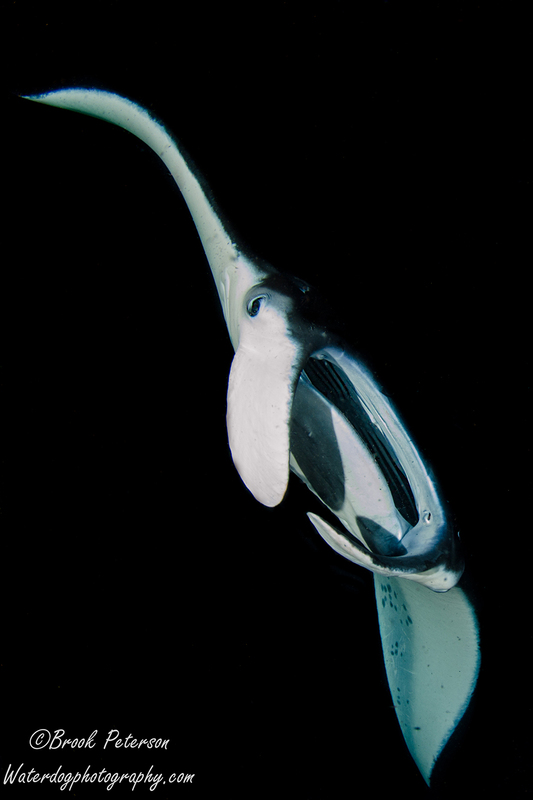 Manta Rays channel water through their huge mouths with the cephalic fins where plankton is caught and digested. The Rays can be individually identified by the markings on their underside. The Manta Ray in the center (below) is named Vinny Ray. I did the dive on two different nights and used two different dive operators. On the first night, I went with Big Island Divers , A fine operation that I would recommend highly. 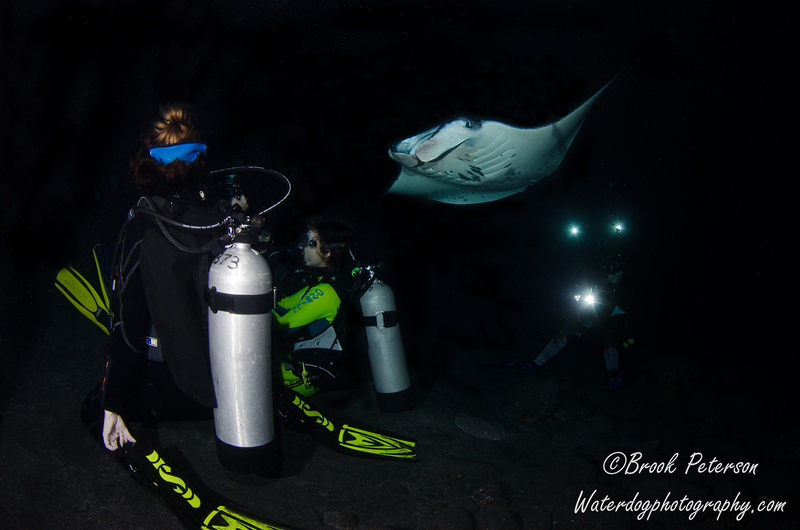 The second night I used Kona Honu Divers, and had a good experience with them as well. Both operations were dedicated to making my experience a memorable one, and they catered to me and my camera equipment. Friends Susan and Madison watch “Lefty” glide overhead. The divers sit or kneel on the bottom (about 35 to 40 fsw) and shine their lights up in to the water column, while snorkelers and boats above shine their lights down. This attracts plankton which the Manta’s come to feed on. The Manta in the image above is named “Lefty” because his left Cephalic fin is paralyzed. Vinny again, coming in from behind. Most Reef Manta Rays weigh up to 1600 pounds and have an average wing span of 16 feet. Their eyes are positioned at the side of their head just above the cephalic fin. 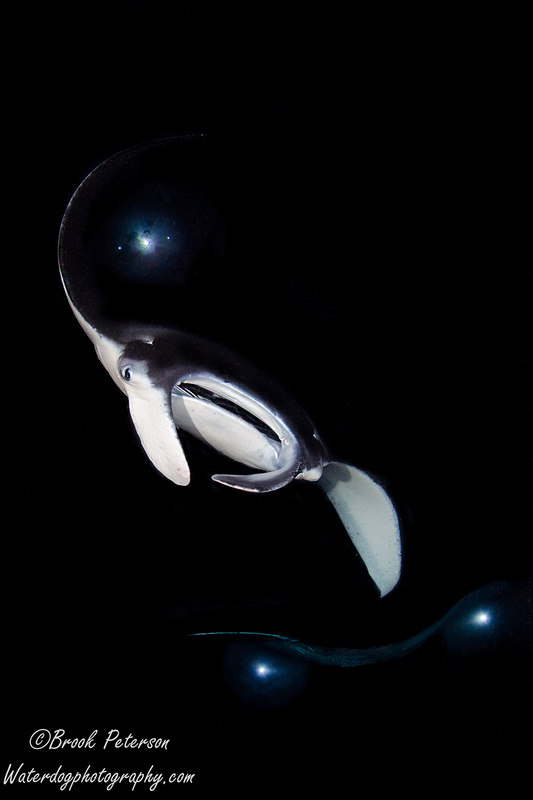 They are known as the “gentle giants” of the sea and look elegant as they glide through the water. The Manta Rays have a slime coating on their body that protects them from infection. If this coating is scraped off, the skin will get red lesions and possibly infections as you can see on the cephalic fins of this manta. 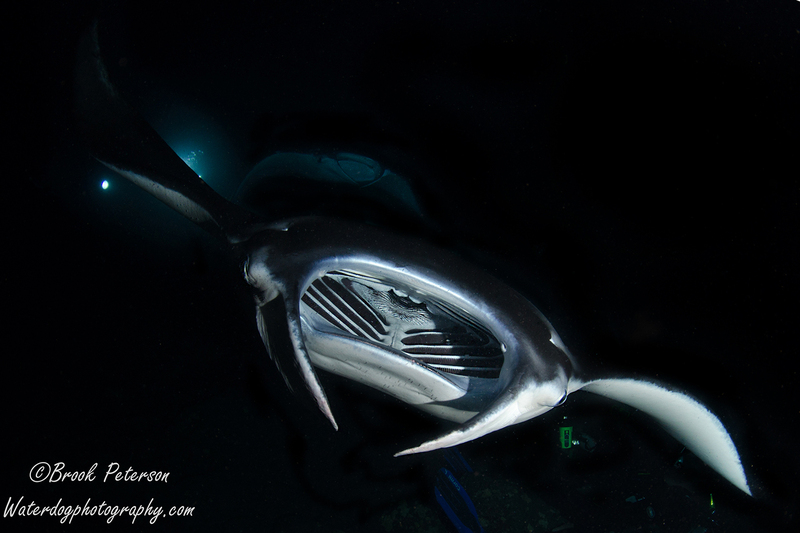 The lights from the boats above and a diver below, shine toward the Manta as it passes over my head. This is an experience I will not soon forget. 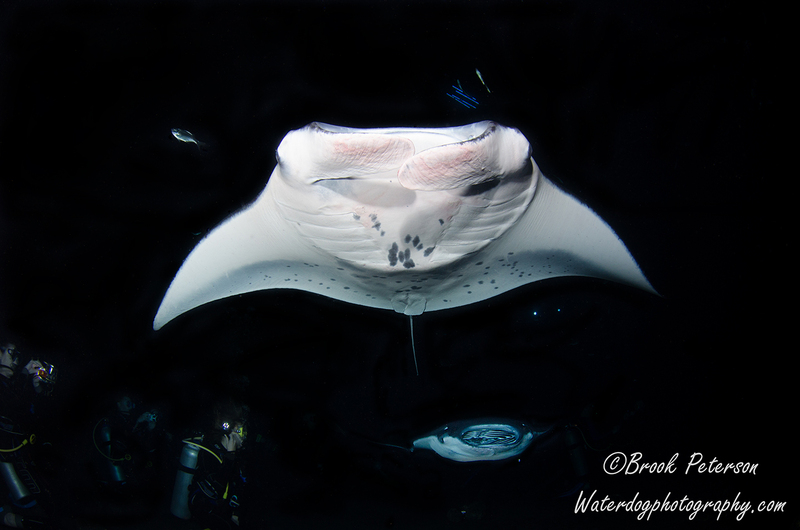 The Mantas swept within inches of my head and did barrel rolls in front of my face. 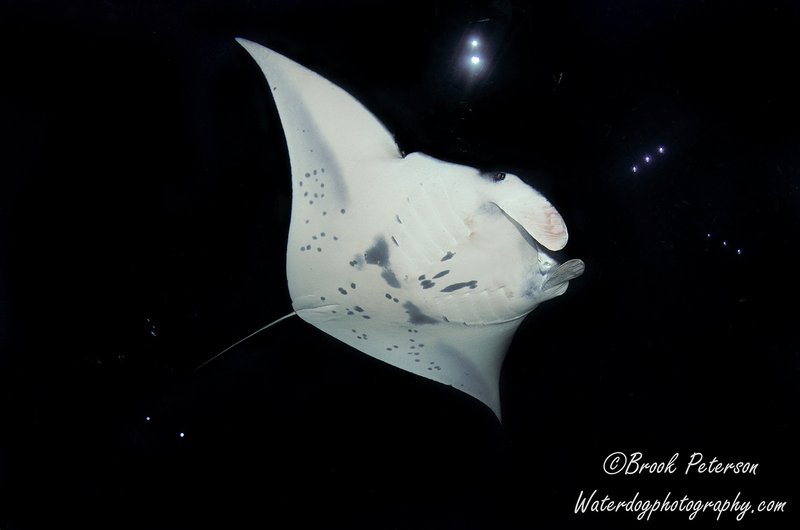 The Kona Hawaii Manta Ray night dive is rated as one of the top 10 dives in the world. It rates as the number 1 night dive in my book. ← Darling it’s Better, Down Where it’s Wetter, Under the Sea! Brook. The amazement continues. You are awesome. Love the writing as well as the photography. Fun stuff. Thank you! It’s such a great hobby and so breathtaking to be in their world! ok now i have seen your shots i have lens envy and will have to put Hawaii on my bucket llst. Kerry, you totally should do that! It is a magical dive and worth the effort–although the rest of Hawaii diving is just mediocre compared with the places you have been! Brook, you have taken photography to a new high with your underwater excursions and I am impressed with the scientific knowledge you have about the underwater world. The one time that I went underwater with you in the Caribbean, it was all that I could do to keep from worrying about breathing and dying, let alone making spectacular images like you have. Lots of love, Dad. Thanks Dad! That means a lot coming from the best photographer I know!